Author of religious lectures which appeared at Salonica in 1795 under the title "Dibre Ḥefeẓ." Zedner, Cat. Hebr. Books Brit. Mus. p. 759. Rabbi in Salonica about 1640; a contemporary of Shabbethai Jonah, with whom he corresponded. Author of "Coplas de Joseph ha-Ẓaddiḳ. This work was written in Judæo-Spanish and published at Constantinople in 1732. Born at Miquenes; a friend of R. Jacob Sasportas. He was thoroughly versed in the Talmud, possessed a considerable knowledge of statesmanship, and acted as councilor to Sultan Muley Ismail. A scholar who went from Toledo to Lisbon, where he established a printing-house from which he issued the following works between 1489 and 1492: an edition of the Pentateuch with the commentary of Naḥmanides, David Abudarham's work on the ritual, Isaiah and Jeremiah with the commentary of Ḳimḥi, Proverbs with the commentary "Ḳab we-Naḳi," and the "Halikot 'Olam," but neither the "Ṭur Oraḥ Ḥayyim" nor any treatise on the Talmud was issued from his press, despite statements to the contrary. Don Judah Gedaliah (not Yaḥya), who was employed in Eliezer Toledano's printing-office, later established a press at Salonica (not Constantinople) with type brought from Lisbon. see also Jew. Encyc. viii. 107. Rabbi at Costa, where he died in 1848. He was the author of the collection of responsa entitled "Mishnat R. Eli'ezer" (2 vols., Salonica, 1853). Jellinek, Ḳonṭres ha-Maspid, p. 7. Son of Eliezer, and brother of Abraham and Jonah Toledano; born at Miquenes, where he suffered great hardships throughout his life. He was the author of the "Derek Emunah," a commentary on the Passover Haggadah, whichwas published, together with the commentaries of Rashi, Samuel ben Meïr, and Yom-Ṭob Ishbili, under the title "Peh Yesharim" (Leghorn, 1838), while his apologetic work, "Terumat ha-Ḳodesh" (ib. 1866), is chiefly devoted to a criticism of Reggio. Steinschneider, Hebr. Bibl. xiii. 54. Brother of Joseph Toledano. About 1700 he was appointed ambassador to Holland and England by Sultan Muley Ismail of Morocco. Lived at Salonica, where he published his "Ḥayyim Medabber," a collection of commentaries on legal codes and rulings (Salonica, 1818). A contemporary of Elijah Mizraḥi and Tam Yaḥya; lived at Brusa about 1530. Zunz, Z. G. p. 440. 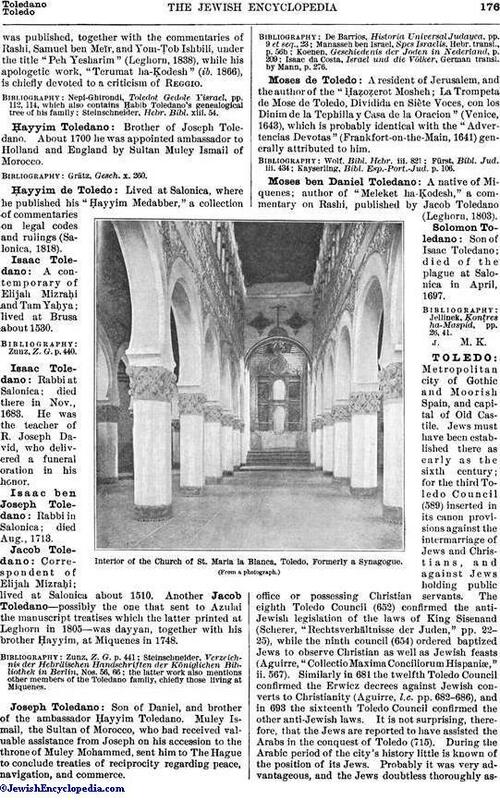 Rabbi at Salonica; died there in Nov., 1683. He was the teacher of R. Joseph David, who delivered a funeral oration in his honor. Rabbi in Salonica; died Aug., 1713. Correspondent of Elijah Mizraḥi; lived at Salonica about 1510. 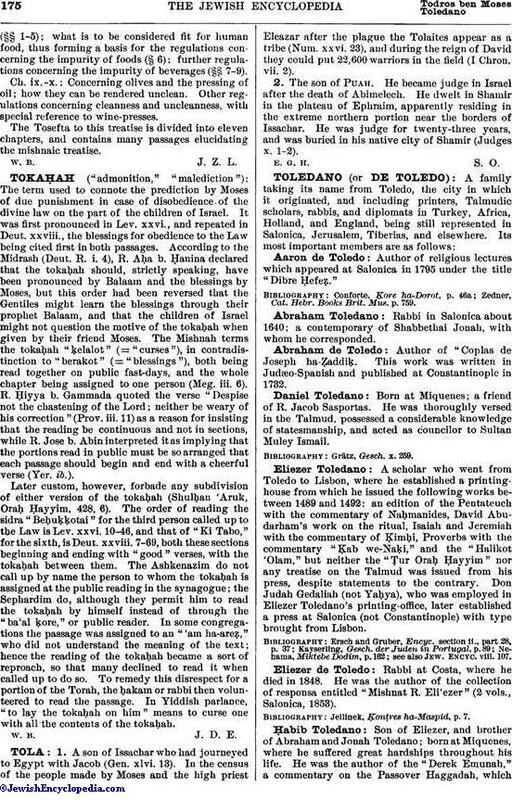 Another Jacob Toledano—possibly the one that sent to Azulai the manuscript treatises which the latter printed at Leghorn in 1805—was dayyan, together with his brother Ḥyyim, at Miquenes in 1748.
the latter work also mentions other members of the Toledano family, chiefly those living at Miquenes. Son of Daniel, and brother of the ambassador Ḥayyim Toledano. Muley Ismail, the Sultan of Morocco, who had received valuable assistance from Joseph on his accession to the throne of Muley Mohammed, sent him to The Hague to conclude treaties of reciprocity regarding peace, navigation, and commerce. Isaac da Costa, Israel und die Völker, German transl. by Mann, p. 276. A resident of Jerusalem, and the author of the "Ḥaẓoẓerot Mosheh; La Trompeta de Mose de Toledo, Dividida en Siète Voces, con los Dinim de la Tephilla y Casa de la Oracion" (Venice, 1643), which is probably identical with the "Advertencias Devotas" (Frankfort-on-the-Main, 1641) generally attributed to him. Kayserling, Bibl. Esp.-Port.-Jud. p. 106. A native of Miquenes; author of "Meleket ha-Ḳodesh," a commentary on Rashi, published by Jacob Toledano (Leghorn, 1803). Son of Isaac Toledano; died of the plague at Salonica in April, 1697. Jellinek, Ḳonṭres ha-Maspid, pp. 26, 41.